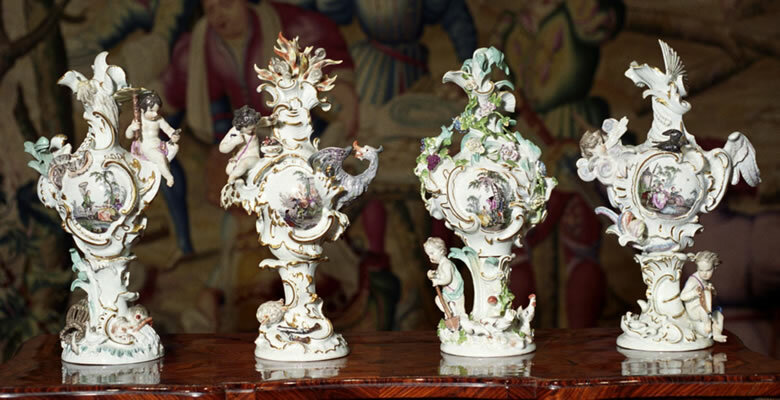 The four pieces were modeled at Meissen by Johann Joachim Kaendler and Peter Reinicke. Each piece is in the form of a rococo vase heightened with gilt and painted on the front with a representative genre scene surrounded by appropriate sculpted attributes. The upper portions rest on separately modeled circular rococo bases. The scenes painted on these vases were adapted from various prints. The first, depicting water by the Venetian Artist Jacopo Amigoni 1673-1752 is the best known. Fire may well be adapted from the same series by Amigoni, although the Meissen Artist has taken liberties with the existing engraving.